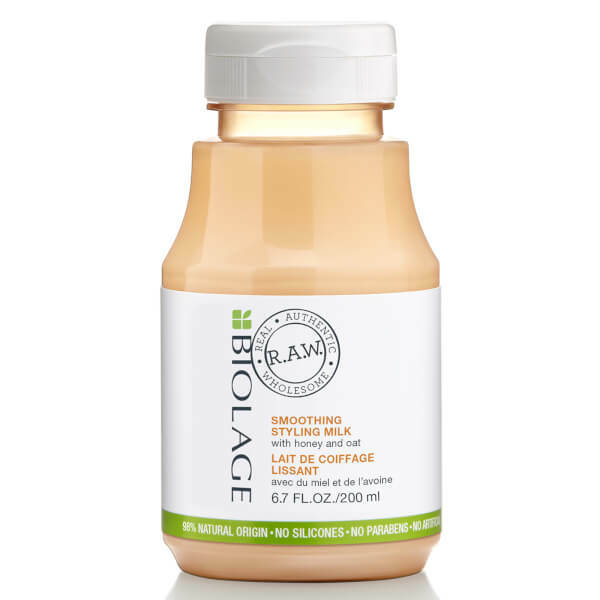 Achieve mirror-like shine with the Biolage R.A.W. 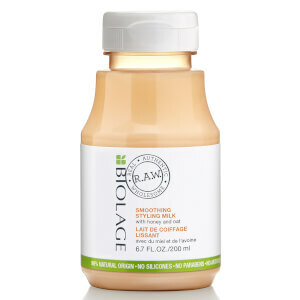 Smoothing Styling Milk; a smoothing milk formula that leaves locks enviably soft and nourished. The styling milk utilises a hair-loving blend of Honey and Oat, which strengthens and conditions the fibre, whilst increasing softness. The hydrating formula offers flexible hold and eases grip during blow drying, making it perfect for creating an array of styles. Expect a smooth and glossy finish that is free from frizz and flyaways. Aqua / Water, Glycerin, Inulin, Isopropyl Myristate, Tribehenin, Cetearyl Alcohol, Microcrystalline Cellulose, Neopentyl Glycol Dicaprate, Hydroxypropyl Guar, Caprylyl Glycol, Dicaprylyl Carbonate, Sodium Benzoate, Cetearyl Glucoside, Cellulose Gum, Citric Acid, Mel / Honey, Avena Sativa Kernel Extract / Oat Kernel Extract, Xanthan Gum, Tocopherol, Potassium Sorbate.